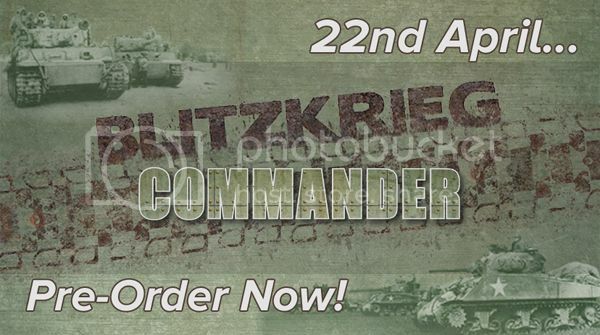 Benno's Figures Forum • Blitzkrieg Commander III available for pre-order! It's been a long time coming, but it's finally here! - Suitable for any scale miniatures, from 2mm right up to 28mm. - Simple command system that emphasises the fog of war. - Effective mechanism for casualty resolution. - Flexible figure ratio meaning one base represents a platoon. - Minimal setup time, simply assemble your forces and play. - Contains 49 army lists covering all nations and theatres. - Suitable for solo, two player or multi-player games. - No supplements, everything you need to play WWII games in one book. - Quick Reference Sheet included. For the existing BKC gamers, you'll probably want to know what's changed in BKC-III? Terrain (movement, visibility and cover) - Revamped and simplified in places. Basic Actions - Now set out in defined actions list. Unit Abilities (including profiles) - Revamped. Command Units - Revamped and can now fight and be knocked out like other units. Engineering - Streamlined and moved to command phase. Exceptions & Special Rules - Extracted into formal 'special abilities' for units. Army Lists - Revamped and increased. If you know and love Blitzkrieg Commander already then BKC-III should hopefully feel familiar but fresh to you. For those new to these rules, grab yourself a copy and see what everyone is talking about! To pre-order yourself a copy, you can either buy directly through our website here: BKC-III or by contacting us using the Contact form on our website: http://www.pendraken.co.uk/Contact.aspx. For anyone attending Salute, you can also pre-order a copy to collect on the day by contacting us through that same Contact Us method. For those who prefer their rules in a digital format, BKC-III will also be launched as a pdf download on Wargame Vault on the same day as Salute, so Sat 22nd April. We'll also have a range of 1000pt Starter armies ready for the launch, more details on those coming soon. BKC-III was launched this weekend at Salute and it's now available on Wargame Vault at the launch price of just £12! : http://www.wargamevault.com/product/210 ... t_filtered The launch price is good until midnight on Saturday 29th, so grab your copy before then! We've just added the previous versions of the 'Commander' rulesets to Wargame Vault, all at the bargain price of £8.00 each!